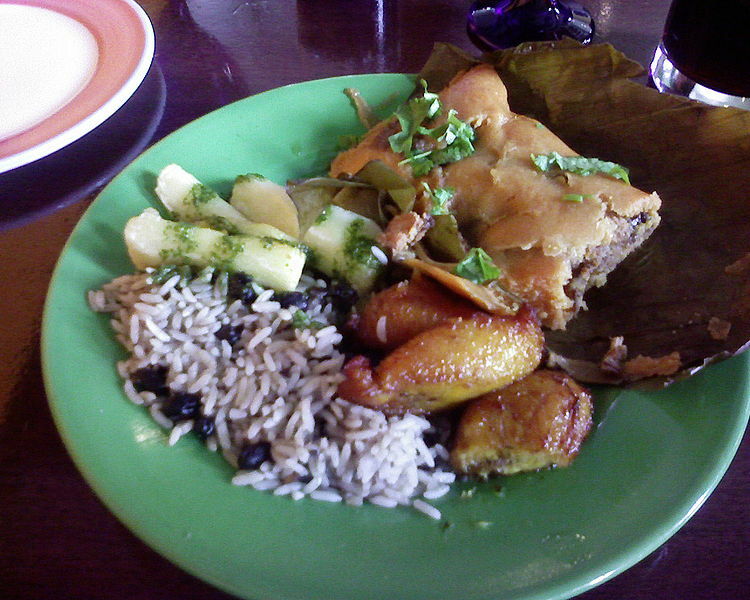 In Venezuelan cuisine, an hallaca typically involves a mixture of beef, pork, chicken, capers, raisins, and olives wrapped in maize (cornmeal dough), bound with string within plantain leaves, and boiled or steamed afterwards. It is typically served during the Christmas holiday. Hallaca is a Venezuelan and Colombian (East) version of the Mexican Tamal. Popular myth has it that, in colonial times, it was common practice for plantation owners to donate leftover Christmas food scraps, such as bits of pork and beef, to their slaves, who would wrap them in cornmeal and plantain leaves for subsequent preparation and cooking, which could take anywhere from 2 to 3 hours. An alternate theory notes the similarity between the hallaca (also known as "hayaca") and the Spanish empanada gallega (Galician pastry), emphasizing that the fillings are almost identical. Hallacas would then be empanadas gallegas using corn flour rather than wheat flour, and plantain leaf rather than expensive iron casts not readily available in the new world in colonial times. However, the most likely origin of the maize body and plantain envelope of the hallaca is the Mesoamerican tamal. This version appears likely because tamal-derived dishes, under various names, spread throughout Spain's American colonies, as far south as Argentina, in the decades following the conquest. The hallaca is the staple Venezuelan Holliday dinner dish and its preparation is practically limited to that time of the year. It is still prepared in a similar fashion to colonial times with some modern refinements. The hallaca is also considered one of the most representative icons of Venezuelan multicultural heritage, as its preparation includes European ingredients (such as raisins, nuts and olives), indigenous ingredients (corn meal colored with annatto seeds and onions), and African ingredients (smoked plantain leaves used for wrapping). The traditional hallaca is made by extending a plantain leaf, greasing it with a spoonful of annatto-colored cooking oil and spreading on it a round portion of corn dough (roughly 30 cm), which is then sprinkled with various fillings. Left: Fillings set out previous to hallaca making. 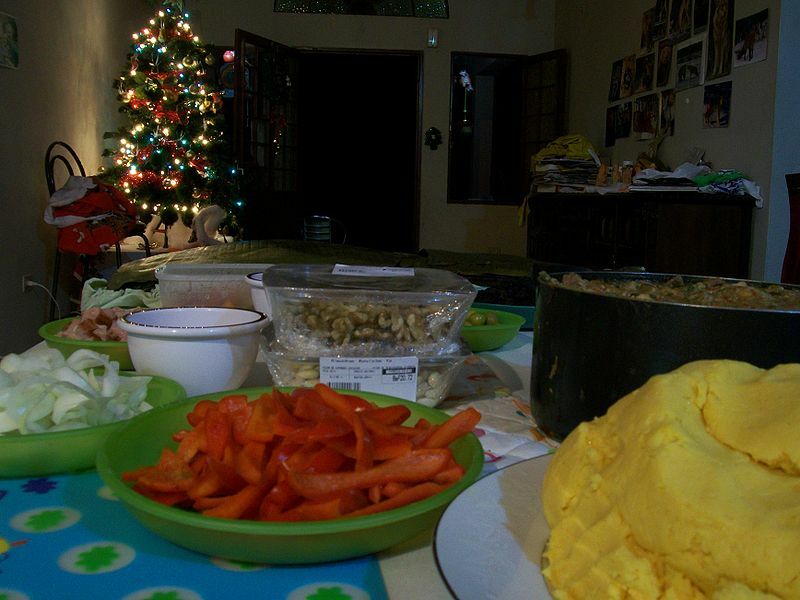 Hallacas are one of the most common traditions during venezuelan christmas. While no two families make hallacas in quite the same way, the most common fillings include a mix of stewed (or rare) meats (pork, poultry, beef, lard, crisp or pork rind), raisins and pitted green olives. Pepper filled olives are becoming more popular nowadays. People in the Llanos (savannah) add boiled eggs and pieces of red pepper. Others might add chickpeas, nuts and almonds. 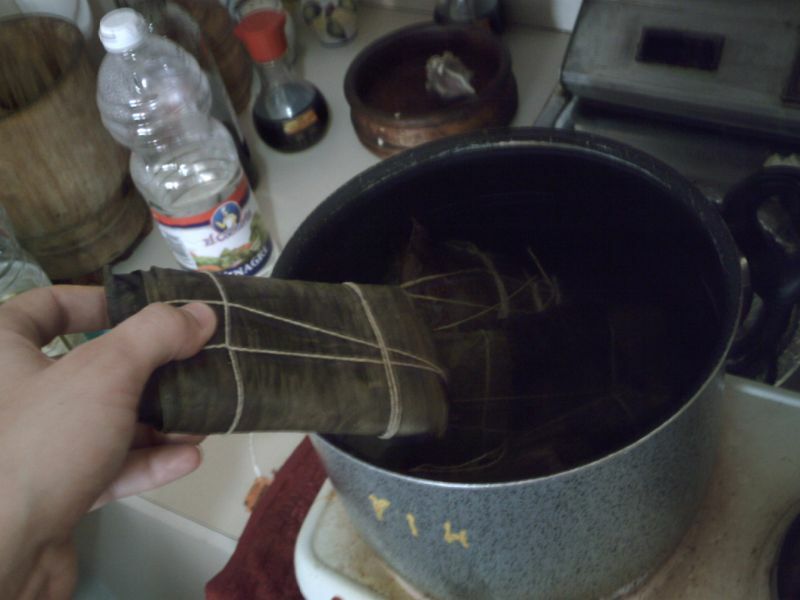 The filled dough is then skillfully wrapped in an oblong fashion and tied with string in a typical square mesh before its cooking in boiling water. Afterwards, it is picked from the pail with a fork, unwrapped and served on its own plantain leaves with chicken salad, pan de jamón (ham filled bread) or plain bread. Left: Cooking hallacas in boiling water. In the Andean region, the filling is cooked with the rest of the hallaca, while in the rest of the country it is usually cooked beforehand. After cooking, hallacas can be frozen for several weeks with no change in flavor. It is common for families to eat hallacas as late as May or June of the next year. Hallaca-making reunites family members at holiday time. It is a job joyfully done by whole families together, marking the start of the holiday festivities. However, the most important part of “hallaca-preparation” is that it represents one of the strongest holiday family traditions in Venezuela, comparable perhaps to Thanksgiving in United States, as it is embraced by all cultures, religions, and social strata.